student is familiar with the tool and can customize for their own use. Little training required to use the device. Students help each other. students could buy a device more appropriate to their specific strengths and needs. We stop teaching how to use applications and concentrate on what we want the student to accomplish with the device. Seamless bridge between formal and informal learning. Student has the device at home. Learning can occur anytime, anywhere. Same device is used at school and home. Increased level of access to technology in the classroom. Student devices tend to be more current and powerful than offered to them in the school. With a variety of devices, often 1 type of device is better suited to complete a task. Encourages working together on a variety of devices. 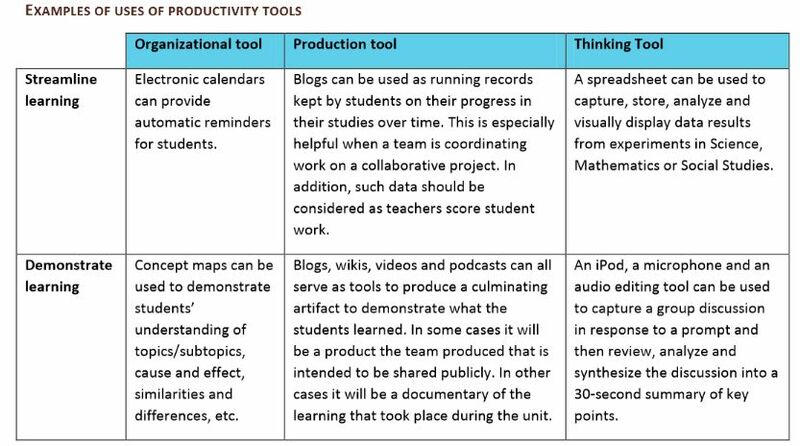 With no standards the tool may not be suitable to meet the needs of the classroom. Weebly – upload content on your web page for easy access for students. Page automatically formats for mobile devices. Also includes a blog. Teachers can have a classroom account where their students can have sites as well. Today’s Meet – generate discussions, conduct a survey, etc. a) Produce presentations, videos, blogs, web pages, wiki, books, essays, infographics, comics, songs, audio, newsletter, photo essay, journal, scrapbook, map, story. b) Tools include iMovie, Windows Movie Maker, Easel.ly for infographics, prezi, adobe voice, explain everything, educreations, and many more. a) Present and Share your ideas to your teacher, class, or world. Upload content to Slideshare, YouTube, website, blog, etc. a) Use Three Ring as an electronic portfolio with reflections.